film and television stars, returns to her jazz roots with the release of the highly anticipated Blue Skies. Monday, April 21, 2008 (Vancouver, B.C.) – Maximum Jazz together with EMI Music Canada is proud to announce the release of "Blue Skies" the highly anticipated new recording by Rebecca Jenkins. Rebecca Jenkins, one of Canada’s most beloved film and television stars, returns to her jazz roots with the release of Blue Skies. Co-produced by Jenkins with Joel Bakan (writer of The Corporation book and film) Blue Skies features Jenkins pure and soulful voice, and her original phrasing and interpretations, on some of the most celebrated standards in jazz music including such unforgettable tracks as Moon River, God Bless the Child and the enchanting title track Blue Skies. Available in-stores across Canada May 27, 2008 via the Maximum Jazz label (a division of the Maximum Music Group Inc) and EMI Music, Blue Skies will also be available for digital download at maximumjazz.com and all other major e-tailers worldwide. Jenkins burst onto the Canadian film scene with her best actress Genie Award-winning performance as a 1940s jazz singer in Anne Wheeler's Bye Bye Blues. Her soulful and charismatic singing and acting in that film launched a career that has included numerous critically-acclaimed and award-winning roles in Canadian and American film and television. She has starred in CBC television’s Black Harbour series, alongside Oscar winners Tim Robbins (Bob Roberts) and Kevin Spacey (Darrow), and in, among other things, CBS's "And Never Let Her Go", "Guilty Hearts", "Catch A Falling Star"; Disney's "Angels in the Infield"; ABC's "The Ruby Silver" and “10.5”; and NBC's "Bad Prospects", "Till Death Do Us Part", and “Harvest for the Heart". As a singer, Jenkins toured and recorded as back-up vocalist with the Parachute Club and Jane Siberry. Over the years she has performed original and other material, including the jazz repertoire, in front of symphony orchestras, on radio shows (among other things, she co-hosted and performed songs on CBC Radio’s Quiet There’s a Lady On Stage, broadcast from the Glenn Gould theatre), at music festivals, on compilation albums (such as Bruce Cockburn’s Kick at the Darkness), at clubs and concert halls, and for film and television soundtracks. Her original song Something’s Coming, which she performed on the soundtrack of feature film Wilby Wonderful, in which she also starred, was nominated for a Genie Award for best original song. She also co-wrote and performed, with Aaron Davis, the title track to “The Sunrise”, a television adaptation of a Margaret Atwood short story, in which she starred and was nominated for a Gemini Award. On May 30 & 31, 2008 Rebecca will be celebrating the release of Blue Skies with two very special performances at Vancouver's Cellar Restaurant/Jazz Club, two shows nightly at 8:30p and 10:15p, for tickets and more information visit www.cellarjazz.com. Wednesday, April 9, 2008 (Vancouver, BC)- The finest in Canadian jazz were honoured at the 2008 National Jazz Awards gala in Toronto Tuesday night. Celebrating its seventh anniversary the NJA's handed out awards in a total of 22 categories and we are pleased to announce that award winning Brad Turner one of Canada's most prominent, prolific and in-demand jazz artists received top honours in the both the Trumpeter and Producer of the Year categories. 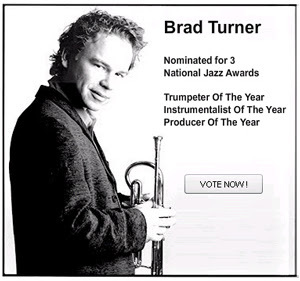 Based in Vancouver, Brad is known mainly for his trumpet playing, (in 2007 Downbeat Magazine named Brad as one of the Top Trumpeters in Jazz) but is proficient on three instruments -- trumpet, piano and drums -- and has recently been gaining more recognition as a world class composer and producer. 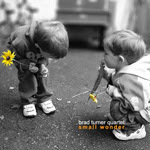 His latest recording "Small Wonder" released Oct 30 on the Maximum Jazz label and distributed by EMI Music has been hailed by critics as a complete album as you will hear with great sound, great playing and great compositions.